Last week a friend contacted me and said 'I hear you are collecting suffragettes! Here is one!' or something along those lines. 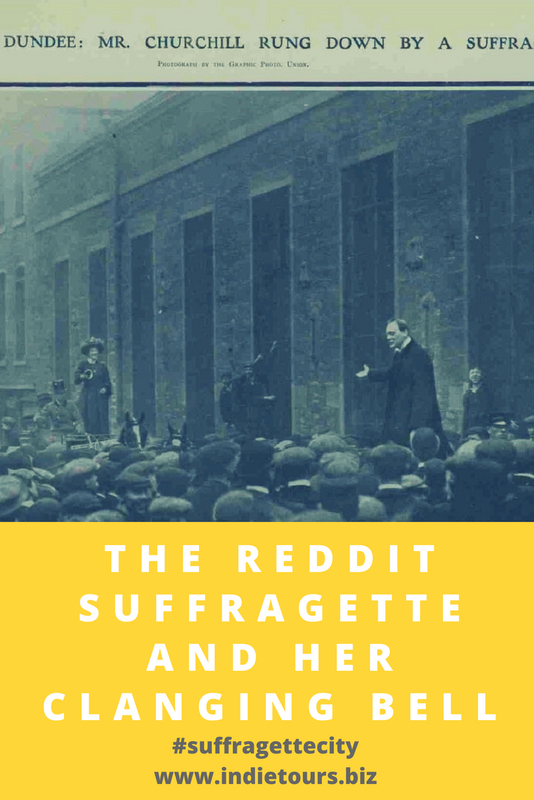 The link led to this page on Reddit, which showed a photo claiming to be "Winston Churchill campaigning in Dundee in 1908, and on the left, Irish suffragette Mary Maloney, who followed him for a week ringing a large bell every time he started to speak." I was intrigued! I am indeed 'collecting' suffragettes. The audioguide will be ready for the centenary for the first time a woman cast her vote in Ireland, in December 2018. It is researched and written. But I had never heard of Mary Maloney! Who was this woman who has become so famous for ringing this bell? Photo as it appeared on the Reddit thread. A quick investigation showed that this image seems to have been publicised by its use on the cover of this book - Undiscovered Dundee by Brian King. Frustratingly though, the photo isn't featured within the book itself, and doesn't describe the 1908 campaign visit by Churchill at all. See the image in the top right hand corner? A few hours later, and a trip around the slight references to the photo on various tumblrs, tweets, and many blogs (and other Reddit threads, and even the University of Dundee website) that celebrate the idea of an Irish suffragette protesting Churchill, I found the origin of the photograph. 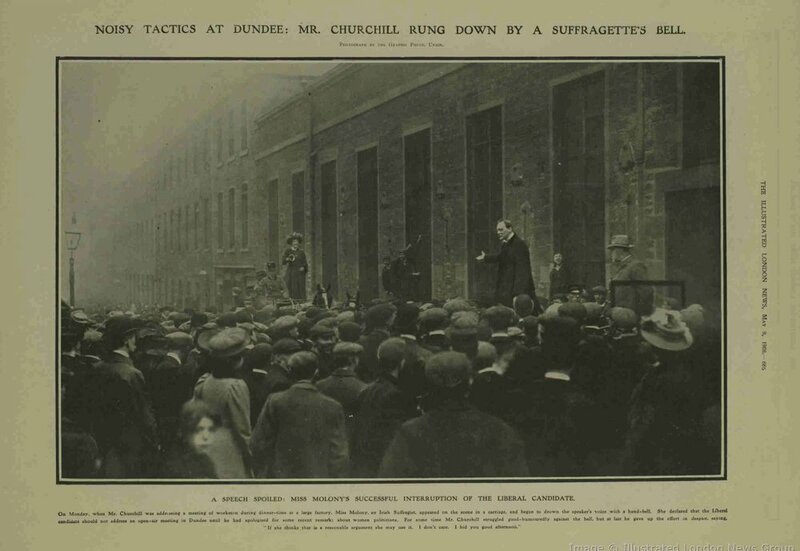 "Noisy Tactics at Dundee: Mr. Churchill Rung Down By A Suffragette's Bell"
On Monday, when Mr. Churchill was addressing a meeting of workmen during dinner-time at a large factory, Miss Molony, an Irish Suffragist, appeared on the scene in a carriage, and began to drown the speaker's voice with a hand-bell. She declared that the Liberal candidate should not address an open-air meeting in Dundee until he had apologised for some recent remarks about women politicians. For some time Mr. Churchill struggled good-humouredly against the bell, but at last he gave up the effort in despair, saying, "If she thinks that is a reasonable argument she may use it. I don't care. I bid you good afternoon." But who was Miss Molony, as we find it now being spelled? 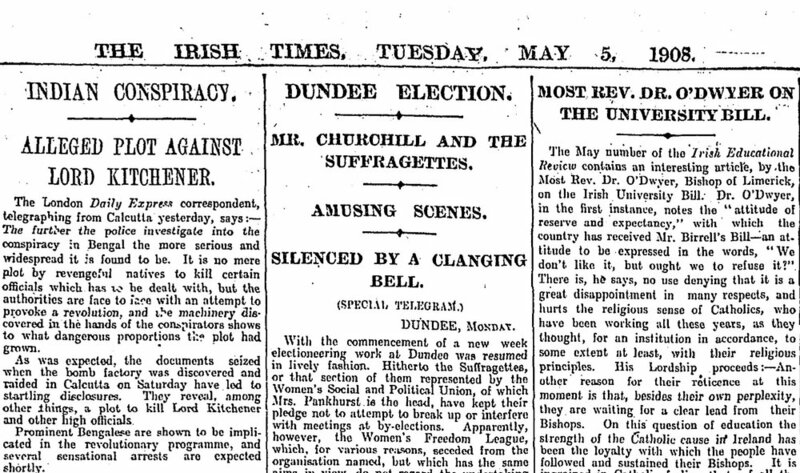 Perhaps a look at the Irish Times for that day in 1908 would illuminate matters, especially if she was indeed Irish. The lady said to be Miss Maloney shook her fist at the right hon. gentleman, and exclaimed in a loud voice, "Who is the strongest - an Irish woman or Mr. Winston Churchill?" Women's Freedom League enamel badge. There is one other source of note of this event, and it is from the 1911 book of the history of the movement written by Sylvia Pankhurst. This account adds the detail that Miss Maloney was afterwards nicknamed 'la Belle Maloney'! From earlier on in the same book, it seems that the bell inspiration came from the Pankhursts' habit of beginning a street meeting by ringing a large bell to attract people. Churchill's relationship with women's suffrage is summarised here. The Dundee by-election - you can read about here. But Miss Dorothy/ Mary/ la Belle Maloney/ Molony remains elusive. She appears in none of the standard works on the Irish suffrage movement. All we know of her is her membership of the England-based Women's Freedom League. Was she living in London or Dundee? What age was she when she moved there? Can we answer any basic questions about her? The bell-ringer in question, close up. It's wonderful that we do have this one image of the lady herself. Her story has been largely forgotten now, and scraps of her are hard to find in the archives, but she seems to have been well-known and valued among her peers. She was remembered as such fifty years' later in the roll of honour. The picture that I've put together of her below is by no means complete, but does fill in some important gaps. Dorothy James Malony was born in Ireland in 1884. Yes, her middle name appears to have been James! I don't know why. Mary seems to have formed no part of her name, so I'm not sure why she survived in her online reincarnation under this moniker. Her parents were John and Hannah; both were 29 years old when they had their first baby, Dorothy, in Ireland. I haven't been able to find out what part of Ireland John and Hannah were living in when they moved in 1885, with their newborn daughter Dorothy, to North Shields in northern England. John found good work as an Inland Revenue Officer, and Hannah kept house. A little boy followed very quickly and was named after his father. In fact, Hannah would go on to have four children in the next six years in England. Dorothy's youngest sibling, at the time still unnamed, was only three months old when the 1891 census which gives us all of this information was filled out. Cropped image of the 1891 census form. Hannah must have had a stressful year! Although her new baby was only three months old, they had already moved from the house he had been born in. When the family filled out the form, they were living about six miles away at 77 Meldon Terrace, in a house which still stands today. John's much younger brother, Michael, lived with them too, and worked as a boatman with HM Customs. It's likely that John helped with finding him this work. 77 Meldon Terrace, Newcastle upon Tyne. We next meet Dorothy as a young, unmarried, woman of 24 years of age. She is living in London, and gives an address of 4 Clement's Inn. This address was used by other suffragettes; it was the where the offices of the WSPU were located. 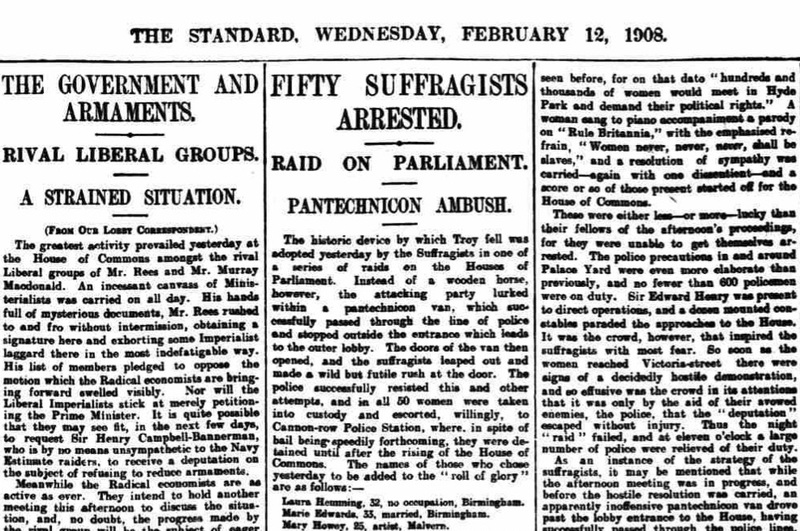 It was February 1908, and she had been arrested with a group of fifty other women. The London Evening Standard reported on the incident. Close-up of Dorothy's entry in the list. 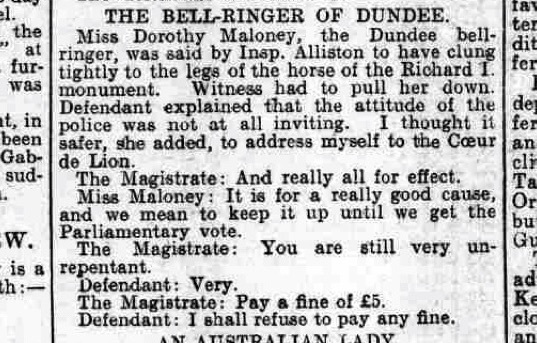 Just two months later she would be ringing that bell in Dundee. And four months after that, she was up on charges of protest activity again. 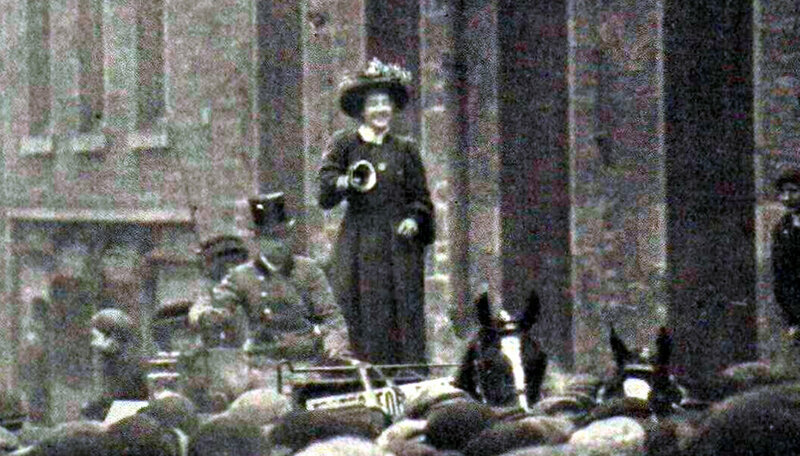 Dorothy appears on Thursday 29th October that year (1908) up on charges of storming St Stephen's Hall, climbing the Richard the Lion-heart statue there, and refusing to come down, instead giving her speech on votes for women from it. Her activities made all the papers. She was one of fifteen arrested. Around well-dressed twenty women had quietly, separately, and unobtrusively walked into the reception area, and pretended that they were waiting there. As the clock struck 8.30, they all stood on their seats, and shouted a prewritten demand that the House adjourn until women were a part of it. After police had succeeded, with some difficulty, in moving them out onto the street, their protest continued. After forty more policemen arrived, a group of four separated from the crowd and, led by Dorothy, ran towards the statue, climbing it and continuing their speech. It was Dorothy who 'captured' the Coeur de Lion. The Globe newspaper edition of the same day singled out Dorothy for her bell-ringing activities earlier that year. By October, Dorothy had turned 25, and her occupation elevated to 'organiser'. This clipping is from The Daily Telegraph, Friday October 30th, 1908. What a year 1908 had been for Miss Dorothy Maloney! I cannot find any mention of her in the papers or records thereafter, or at least none I can be sure of. She doesn't claim any part of modern studies of the Irish suffrage movement, mainly because she doesn't seem to have carried out any activities in Ireland, or been a member of any Irish organisations. Ironically, when she does appear in the English literature, it is as 'the Irish' suffragette. I can find no mention of her in correspondence archives with Irish activists, or mention of her meeting any of them when the travelled over to network with the movement on the other side of the Irish Sea. She also seems to have escaped prison time, receiving only fines for her behaviour, which were paid by a woman who was well-known to the Irish suffrage movement, Charlotte Despard (in her capacity as a founding member of the Women's Freedom League, to which Dorothy belonged). The glimpses that we have been able to collect of her show her daring nature, her humour, her strong sense of her Irish heritage, and her bravery. She was committed to the cause, and even though she was a member of the group that had ceded from the WPSU, Sylvia Pankhurst still celebrated her contribution. Perhaps more details of the life of the Mysterious Miss Maloney will come to light in time. Do You Know Where The First Offices Of The First Suffragette Society in Ireland Were Located?